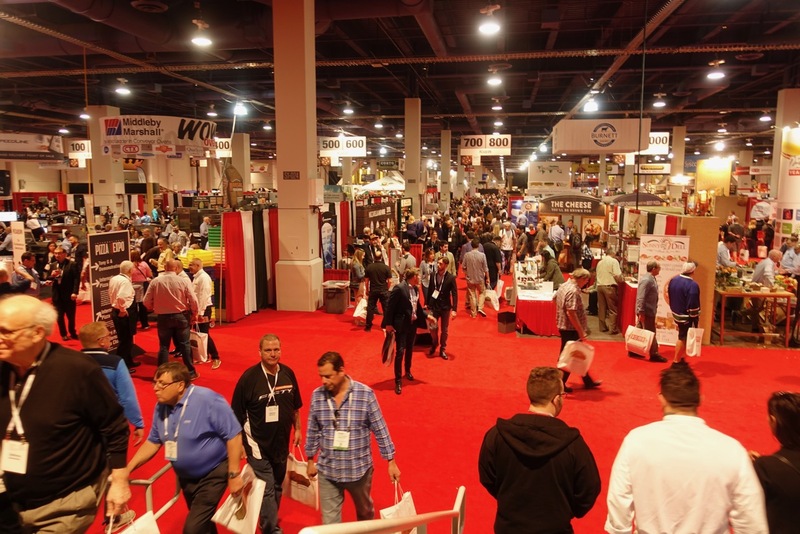 The South Hall of the Las Vegas Convention Center was crowded for the March 19-22 Pizza Expo. 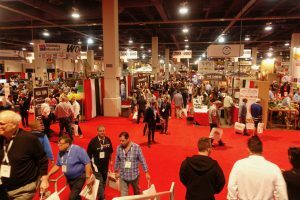 Last week I attended a trade show at the Las Vegas Convention Center that most of the public would have loved. The International Pizza Expo, also known simply as Pizza Expo, features lots of free samples of pizza, pizza ingredients and drinks and desserts to accompany pizza. However, sadly, Pizza Expo is not open to the public. Instead, the show is for owners and managers of independent and chain pizza restaurants. Everything that might appeal to this audience is on display: pizza ingredients and flours, kitchen equipment, pizza marketing and promotional materials, pizza-related items such as liners and boxes, and even games for the restaurant. Las Vegas show girls Stevie Lee and Joyce make certain Pizza Expo attendees know they are in Las Vegas…at the Milano’s booth. An attendee can’t walk 10 feet, however, without seeing another tray of free samples. Observers might say I ate my way around the show, but I took a video as well. My focus was the trade show, so I did not attend any of the show’s workshops or educational offerings on topics such as “Gluten-Free Top Sellers”, “Proven Menu Engineering Techniques” “Pizza Crust Boot Camp” and “The Million Dollar Pizzeria”. Lots of competitions are part of the show. Pizza Expo hosts an International Pizza Challenge (complete with bake-offs and judges) and the World Pizza Games (skills competitions.) On Tuesday evening, attendees could also participate (for $250) in “A Guided Tour of the Best Pizzerias” in the area. The pizzerias on the tour were Pizza Rock, Metro Pizza and Dom DeMarco’s Pizzeria. At the show itself, I found a number of family-owned businesses and saw lots of interest in gluten-free cheeses. Yes, cheeses made using ingredients such as soy and coconut oil tasted pretty darn good, though not quite the same as the dairy cow’s ultimate product. 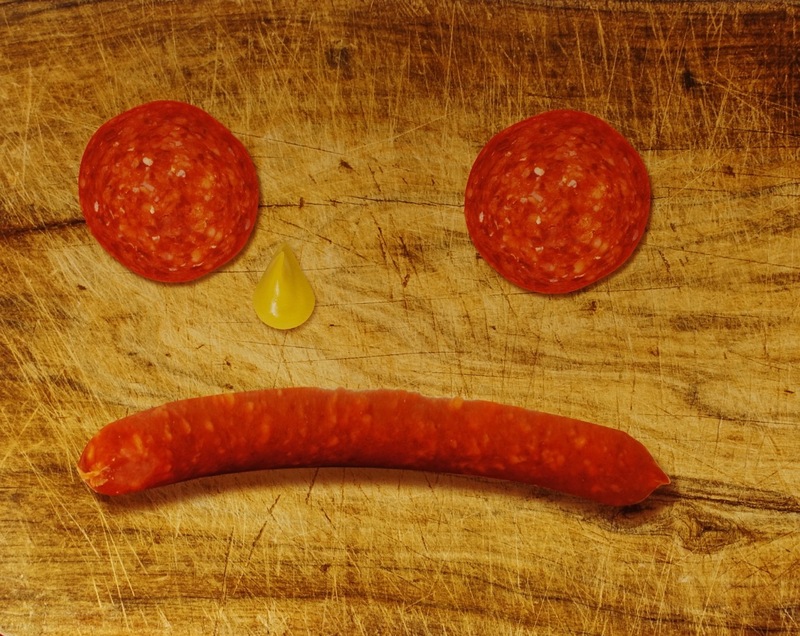 A sad face that was part of Liguriai marketing. A number of bread makers come to this show and I was surprised, as I was leaving, that a man in one of the bread booths spotted my nametag and said, “You’re a local. Here take these home and bake them for 10 minutes at 350 degrees.” Just then, he grabbed two long thin French bread loaves in paper sleeves and handed them to me. I wasn’t sure whether the gentleman was just being kind or whether the bread was about to dry out, but I nonetheless thanked the baker, took home the bread and impressed a house guest that I had real influence at Pizza Expo. A couple of facts from the show: Expected attendance was between 7000 and 8000 buyers. Pizza restaurant industry revenues are an estimated $43 billion in annual sales. Pizza Expo is the largest pizza show in the world. Great! But, WOW…have ingredients changed! I’ll need to stop by one of the “better” za places in Vegas when I’m out there and see how it compares to Uno or Due in downtown Chicago. Didn’t see any deep dish in the video…I hope they still make them. Thanks for a view into the inner workings of pizza restaurants. Great video, Diane. Enjoyed the show.